If you want to stay for 1 to 3 months or more at a most beautiful and quiet setting, surrounded by wonderful nature in Costa Rica, this is it. 60 to 80 degrees max. year round. Contact us for any questions you have. 2 bedrooms 2.5 baths and beautiful green areas , walking distance from downtown Atenas. Safe environment. MINIMUM ONE month rental and up. No annual rental. This is our vacation property we own and share with visitors who want to enjoy Costa Rica for at least one month. Lots of sun, friendly people and peace and quiet. 40 minutes to the Pacific Ocean. Safe and beautiful countryside, all services available 4 minutes by car. 35 minutes to the airport and 65 to 83F year around. look at the pictures and our website. Safe, quiet, beautiful views from every room in the house, perfect for a nice couple retreat. 15 minutes walking distance to downtown Atenas, or 3 minutes by car. Most spectacular scenery, pristine, quiet, and perfect temperature. from bedroom to bedroom with Den in between. sliders open up into all-in-one living room deck under roof. 2 stories house with no elevator. I Pod player radio, Cat is welcome, no dogs. This is our 2nd year staying in this cozy home. We are going back next winter. That says it all. Love staying there. Well equipped and inviting. Close to all amenities needed. Safe and friendly ! I spent a month at this house, I was looking for solitude and quite time, and I got what I wanted. Taxi service for about $3US will get you to town, stores, ATMs, and many restaurants. I found everyone friendly and helpful. Thank you Marvin. We are glad you enjoyed your stay, please keep us in mind for future visit to Costa Rica. 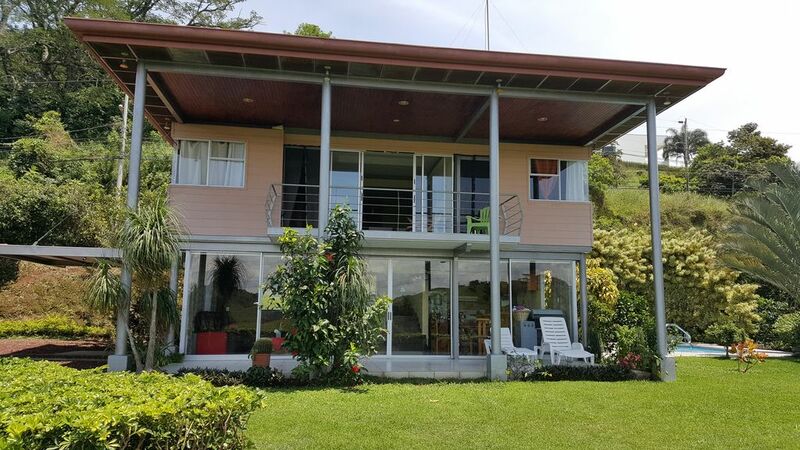 The property is away from me the town but close enough to grocery shopping, restaurants, and a convenient highway that will give you access to airport and many other of Costa Ricas main attractions. It has a nice size pool with beautiful, relaxing surroundings. The owner, Sonia was very nice and accommodating. There are some typical Costa Rican restaurants in town but our favorite was Etnias for live music on Fridays and some nice Tapas. We enjoyed our stay very much and recommend to others who don't want the typical touristy larger cities. Thank you , Sonia for letting us stay at your place in the mountains! You are very welcome. It was very nice to meet both of you. What a nice subdivision (gated) nestled in the hills of Atenas. Peaceful, good views, well kept property. We stayed here a month while our home in San Ramon was being finished. I loved the layout of the home with two floors, and everything we needed was provided. We also loved Atenas and go back there often. The weather in the summer can get a bit warm during the afternoons, but the home has a nice pool to help you cool off. One of my favorite things was sitting on the patio in the morning, enjoying my coffee and writing in my journal. Wonderful. A big thank you to Sonia for her hospitality. Thanks William, and good luck with your new house. It was nice to meet you and your wife. 35 minutes to famous beaches with all activities, by car or bus, or, same time to San Jose to Theaters, Museums, Vulcano, shopping by car or bus. Rates include wireless high speed internet, Power, TV Cable, Water, local phone calls, garden and pool cleaning. No dogs allow, non smoking.